First big reveil at Shot Show 2018 is the new Modular Training Weapon from Wolverine Airsoft. They once again show to lead the way in HPA innovation. We have shot a prototype of this item during a private after party at Shot Show 2017. And it was IMPRESSIVE! We are finally able to talk about it and will tell you all about the final production model. Actually it's more like a platform! They claim it will be the perfect HPA Airsoft gun. The official announcement tells us: "The MTW platform is designed to be more than just a new product. It was created to be en entire ecosystem in which the customer can use all of our products we have developed over the past few years in seamless harmony. No more modifications, no more aligment issues, no more low quality AEG bodies. This platform truly takes pneumatic systems for airsoft to the next level as it unshackles them from the restrictions of being simple aftermarket modifications. 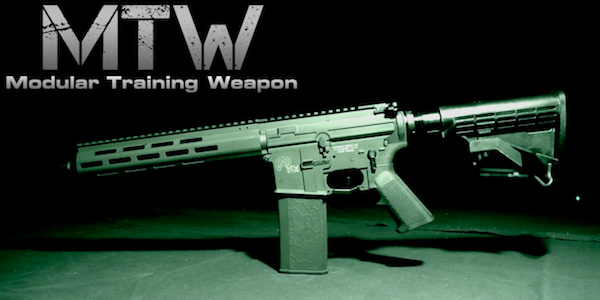 Instead the MTW has been designed around all the incredible potential of our HPA technology."